As President Donald Trump met with survivors and others impacted by the spate of mass school shootings across the US at the White House on Wednesday, he held a cue card with notes on how to appear empathetic while proposing solutions like tightening the federal background check system, raising the age of firearms purchases, having teachers store firearms, or, you know, casually employing roving squads of armed veterans to patrol schools. Trump didn’t appear to use the visible prompts, but he did cast a tender tone during the event, saying he grieved for those affected ... He was briefed by White House officials before participating in the listening and did not use a teleprompter during the event. Astute observers will also note that the president has apparently embroidered the number “45" into his cuffs, because sure, whatever. This is a pattern. Notable prior incidents in which someone in the White House was caught revealing something they shouldn’t have to the high-definition eyes of the press corps included when cameras caught prospective Department of Homeland Security chief Kris Kobach’s strategic plan to boot “criminal aliens” out of the country, or the time longtime bodyguard Keith Schiller revealed Secretary of Defense Jim Mattis’ private cell phone number. 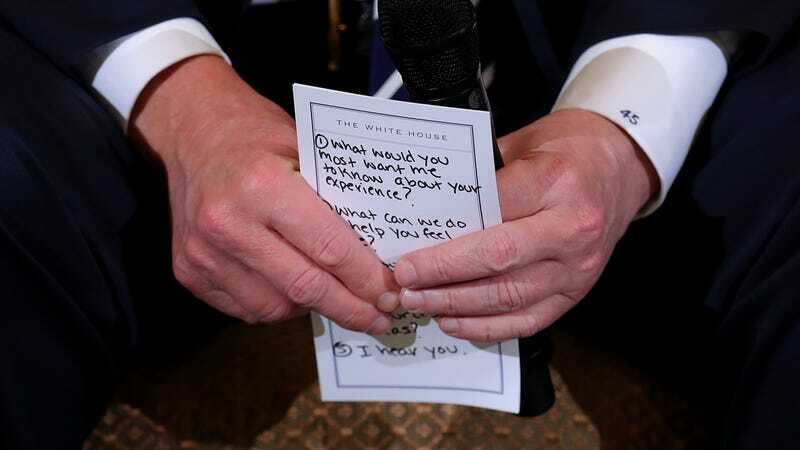 Almost all politicians use cue cards or teleprompters to some extent, though the most favorable spin on this for the White House would probably be that a written reminder to tell friends and relatives of mass shooting victims that he is, in fact, listening to them is deeply insulting to the president’s intelligence. The less favorable spin would be that someone in the administration is concerned that Trump’s human guise would slip in the middle of the conversation. Take your pick, folks.